Legal action taken against the British government to secure compensation for four Kenyans allegedly tortured during the Mau Mau uprising will cast the spotlight on one of the Empire's bloodiest conflicts. The uprising is now regarded in Kenya as one of the most significant steps towards a Kenya free from British rule. The Mau Mau fighters were mainly drawn from Kenya's major ethnic grouping, the Kikuyu. More than a million strong, by the start of the 1950s the Kikuyu had been increasingly economically marginalised as years of white settler expansion ate away at their land holdings. Since 1945, nationalists like Jomo Kenyatta of the Kenya African Union (KAU) had been pressing the British government in vain for political rights and land reforms, with valuable holdings in the cooler Highlands to be redistributed to African owners. But radical activists within the KAU set up a splinter group and organised a more militant kind of nationalism. By 1952 Kikuyu fighters, along with some Embu and Meru recruits, were attacking political opponents and raiding white settler farms and destroying livestock. Mau Mau supporters took oaths, binding them to their cause. In October 1952 the British declared a state of emergency and began moving army reinforcements into Kenya. So began an aggressively fought counter-insurgency, which lasted until 1960 when the state of emergency was ended. The number killed in the uprising is a subject of much controversy. Officially the number of Mau Mau and other rebels killed was 11,000, including 1,090 convicts hanged by the British administration. Just 32 white settlers were killed in the eight years of emergency. The Kenya Human Rights Commission has said 90,000 Kenyans were executed, tortured or maimed during the crackdown, and 160,000 were detained in appalling conditions. David Anderson, professor of African Politics at Oxford University, says he estimates the death toll in the conflict to have been as high as 25,000. He said: "Everything that could happen did happen. Allegations about beatings and violence were widespread. Basically you could get away with murder. It was systematic." The African Home Guard, recruited by the British, used oppressive violence as a means of controlling the population, Prof Anderson suggests. He said: "The British armed the militia, rewarded them, incentivised them, allowing them to pillage property of the nationalists. "Mau Mau families were subject to pillage by their neighbours. People would simply walk up to the farm and walk away with things." In addition to search-and-destroy missions against Mau Mau fighter bands operating in the forests, the British also strategically resettled Kikuyu in villages. 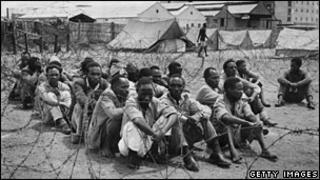 They also detained some 100,000 Kikuyu without trial, often for periods of between three and seven years. London law firm Leigh Day & Co lodged a claim in mid-2009 on behalf of five elderly Kenyans. One has died since the case was lodged. The firm says its clients suffered terribly in detention camps or at the hands of British-led soldiers. Solicitor Martyn Day told the BBC: "They were put in camps where they were subject to severe torture, malnutrition, beatings. The women were sexually assaulted. Two of the men were castrated. The most severe gruesome torture you could imagine. "A lot of the officers involved were white, they were controlling the violence against these Mau Mau. It wasn't just isolated individual officers. It was systematic. The whole purpose was to break the Mau Mau." The UK says the claim is not valid because of the amount of time since the abuses were alleged to have happened, and that any liability rested with the Kenyan authorities after independence in 1963. But Leigh Day & Co says the case is an "opportunity for the British government to come to terms with the past and apologise to the victims and the Kenyan people for this grave historic wrong". South African Archbishop Desmond Tutu has backed their case. "In my view, the British government's attempt to pin liability on Kenya for British colonial torture represents an intolerable abdication of responsibility," he said. "Britain's insistence that international human rights standards should be respected by governments around the world will sound increasingly hollow if the door is shut in the face of these known victims of British torture." But it is clear that brutal violence was exacted on both sides. Prof Anderson explains: "There was lots of suffering on the other side too. This was a dirty war. It became a civil war - though that idea remains extremely unpopular in Kenya today." One example was the Mau Mau raid on the "loyalist" village of Lari, where the majority of the men were away fighting with the British Home Guard. The rebels killed more than 70, mostly women and children. Tim Simmonds, who joined the Kenyan police reserve as a tracker shortly after settling in Kenya in 1954, says the Mau Mau fighters "went on the rampage", slaughtering thousands of people, leaving him so frightened he slept under his bed for a year. While deploring the treatment of detainees in the camps, he says he has no regrets about fighting the insurgents in the bush. "They really got what they deserved. I'm really quite tough on this. If I had the chance again in the same situation, them killing people, would I go out and kill them again as I did? Yes sir I would." It has long been suggested that the suppression of the Mau Mau was more brutal in nature than the action taken against other colonial uprisings across the British Empire. Some historians have posited that white settler pressure on the British government and the characterisation of the Mau Mau fighters as the epitome of savagery may have been behind this. The Kikuyu themselves were split, with "haves" often siding with the British against Mau Mau "have-nots" and many happy to take the confiscated land of their fellow villagers. Prof Anderson notes that one of the things marking the battle against the Mau Mau was the number of hangings, with capital offences extended during the emergency to include "consorting" with Mau Mau. Some attention was paid to allegations of atrocities at the time, with questions asked in parliament about 11 Africans beaten to death in a British camp at Hola. Among those who spoke out were the Labour MP Barbara Castle and the Conservative Enoch Powell, now best known for his "rivers of blood" speech. He suggested at the time that if such killings were to go unpunished Britain did not deserve an empire. "I would say it is a fearful doctrine, which must recoil upon the heads of those who pronounce it, to stand in judgment on a fellow human being and say, 'Because he was such-and-such, therefore the consequences which would otherwise flow from his death shall not flow.'" Even though the Mau Mau were thoroughly defeated by 1960, the exact reforms that nationalists had been pressing for before the uprising had started and, by 1963, Kenya was independent.